Love the pink <3 So excited to see what you guys get up to! That's a great coat. Have fun in Paris. Such a great look! So cool that you're going to PFW! Enjoy! Fur coat seems popular this year. You are so beautiful with this pink fur coat. Damn girl, this look is awesome! 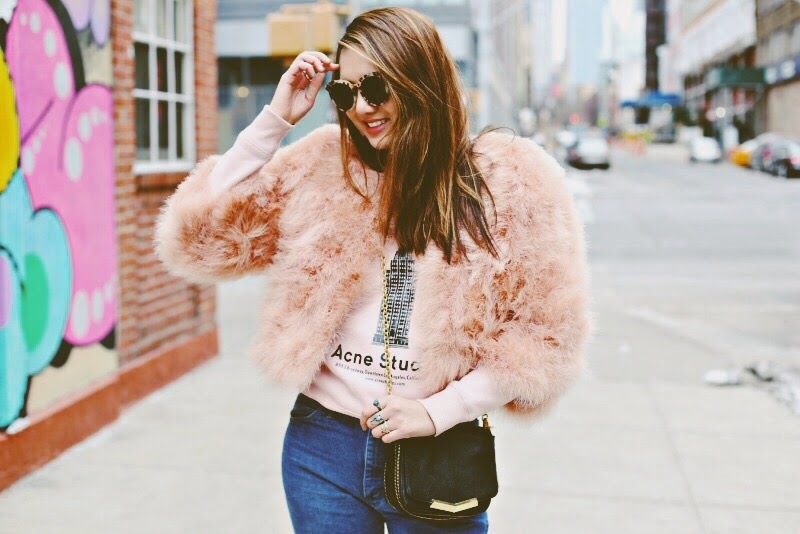 You are such a true beauty and the pink furry coat is so amazing . wow so stunning love all of your pictures and the high waisted jean , I think I should give it a try. Love this shade of pink, I'm on the hunt for some blush before summer hits! Lovely outfit! I love Paris, it's my home away from home, enjoy it!! Super cute, I just love that color pink. What a wonderful look, I am in love =) you inspired me ! C trop mignon ce sweat avec ce pantalon !